Christie and Zelly are beautiful, fun-loving Tabbies who are always an inspiration to paint; find them in the Astrology gallery and keep your eyes out for them as their affection, the loving warmth of their souls and their expectation of unconditional love may be found - captured in the Christmas, Deco and Wrap-Round Ceramics galleries too. The Constellation of Gemini is celestially represented in the Zodiac by two stars, known as Castor and Pollux, the Heavenly Twins. On a more earthly level, Christie and Zelly, also twins, were born under its influences, which are varied and fast moving. 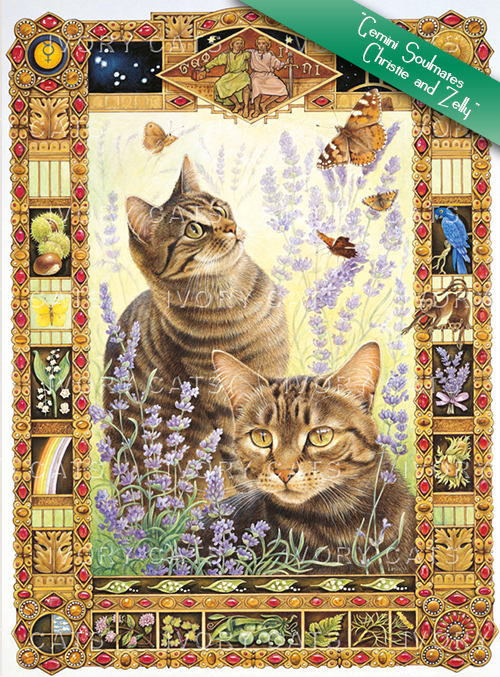 Not that a cat would ever conform to any influences other than those it chose itself, but it has been observed that between them, Christie and Zelly have shown practically all the traits attributed to the typical Gemini sway. They are friendly, flirtatious, crafty, sometimes even catty, moody, adaptable and charming; all at once; then suddenly changing their minds and rushing off to find something new to investigate. Variety is their spice of life, they live each moment to the full, and are often referred to as the Butterflies of the Zodiac. Christie and Zelly are beautiful warm Tabbies, fun loving and a joy to live with, and most entertaining to observe their ever changing reactions to the world around them. Always an inspiration to me, especially for this painting. Their enthusiastic, positive nature far outweighs their less attractive mood swings - which don't last long anyway - they are quickly on to fresh themes of discovery and exploration. It is said that Geminis are forever seeking their true Soulmate, I like to think perhaps for Christie and Zelly that Soulmate is me, after all, I am a Gemini too. One common state remains unchangingly firm, they are affectionate, warm loving souls, and expect unconditional love in return. Now, like Castor and Pollux, they are for me, twin Tabby Stars, forever next to each other in the sky.